Amazon’s sprawling retail empire knows no bounds. A long way from its humble beginnings as an online store for books, the internet giant now offers pretty much anything you could want delivered with the press of a button. Its most recent launch in the UK is Amazon Pantry, a consolidation of its grocery and store cupboard products that see the company hoping to take a bite out of national supermarket’s home delivery options. Unlike with a regular Amazon delivery, Amazon always charges for delivery of its Pantry boxes, no matter how long your delivery time slot or how much you spend overall. Each delivery was indicated for two days later, at least at the point of addition to your list. You need to be a Prime subscriber to use the service too. Each Amazon Pantry box can hold 20KGs; the first is charged at £2.99, while any additional ones are 99 pence each. As you add items on Amazon, it tells you what percentage of the box each item will take up, and how much you’ve used overall. For comparison of supermarket deliveries, some can cost as much as £7 if booked at the last-minute for a popular time slot, but you can also get a whole delivery for £1 from most of the major stores. Many of the biggest supermarkets also offer a home delivery pass for between £60 and £110 each year. In a way, this fee is almost analogous to Amazon’s original Prime subscription fee – for a while, free delivery was probably the most appealing part of Amazon’s Prime service in the UK, certainly before its video streaming service launched here. So, what can I get? The available items are spread across a range of categories (and sub-categories) for you to choose from, or you could opt for a themed, pre-filled Pantry box. Unlike the general shopping experience at Amazon, its range of Pantry products feels pretty limited right now. For example, you can buy regular size (1.75l) bottles of Vanilla/Cherry Coke or Caffeine-free Diet Coke, but you can’t buy a regular size bottle of Coke or Diet Coke. If you want those, you have to opt for a more expensive pack of cans instead. Nonetheless, you can buy in quantities you might actually want – Amazon previously offered a few home food staples, but they were often only available in abnormally large packs. You will want to keep an eye on the percentage showing you how much of a box you’ve used though – and I’ve got no explanation for identically-sized products taking up a different amount of each box, as you can see sometimes happened below. The same sort of selective limitations seem to be present across most categories – if you’re set on buying a particular brand of everything, then sooner or later you’ll probably be disappointed. That’s not to say Amazon Pantry is short on products, but it is short on varieties within most products, and as such, compromising is probably a position you should be willing to adopt if you want to try Pantry. In total, it took me about three days to finish my order, as I added a few items at a time when I remembered. The experience of pulling the order together wasn’t a very natural one, though this could perhaps be more to do with the limited availability from Pantry than a supermarket. As it offers no fresh produce in the UK yet, you have to mentally (or actually) make two separate shopping lists; one with stuff you can order from Amazon and one with stuff you can’t. Like with the rest of Amazon, you can filter the products by brand, price, rating, etc. down the left-side of the page, but the lack of variety made this largely pointless. Ultimately, it was more a sense of giving up on trying to ‘finish’ the order and just hitting the confirmation button that pushed me to get the job done. It cost around £56 for the Pantry items, and I’d also orderded a mini-DVI to HDMI/DVI converter at the same time, which ultimately turned up alongside my Pantry delivery in its own small little package. Whatever Pantry’s failings, being able to have anything else from Amazon delivered alongside your store cupboard items is pretty convenient. The pantry delivery cost £3.34 (before VAT) for two boxes – I’d filled one, and 15 percent filled the second before giving up. I encountered a slightly strange bug when checking out that showed every item in my list as out of stock, but I carried on anyway and didn’t have any issues. Tip – As I added items to my basket over a few days, I saw the price fluctuate quite frequently considering the relatively few items I had in my basket. The most notable was a bottle of lemon squash that was reduced from £3.50 to £2.00, so it’s worth keeping an eye on these. Getting it cheaper is a nice little bonus, but seeing that it cost nearly twice as much as I’d have expected wouldn’t have been so good the other way around. You can imagine my surprise, having paid for two boxes, to see one huge one turn up, and a delivery driver warning me/half complaining that it weighs 30KG. It was nice that it turned up at all though, considering I’d received an email the night before telling me it would be another two days. Getting it upstairs wasn’t too much of a struggle, but I’m 34 and relatively capable – older or weaker people wouldn’t have managed it, and would instead have needed to carry items up individually. The lack of two boxes made no difference, as the one huge box that arrived wasn’t even full – I’m not sure why Amazon is splitting deliveries into boxes of 20KG if it’s then not actually going to deliver them like that; I’d imagine a few 99p refund requests heading Amazon’s way. Everything I had ordered was there though – no items missing, no substitutions (as you might get with a supermarket delivery). The only real (and very minor surprise) was that a bottle of sauce that had arrived was slightly smaller than its specified size on the site. I think I can probably let 15ml of burger sauce slide, but it’s a reminder to keep an eye on the sizes of the items you’re ordering. 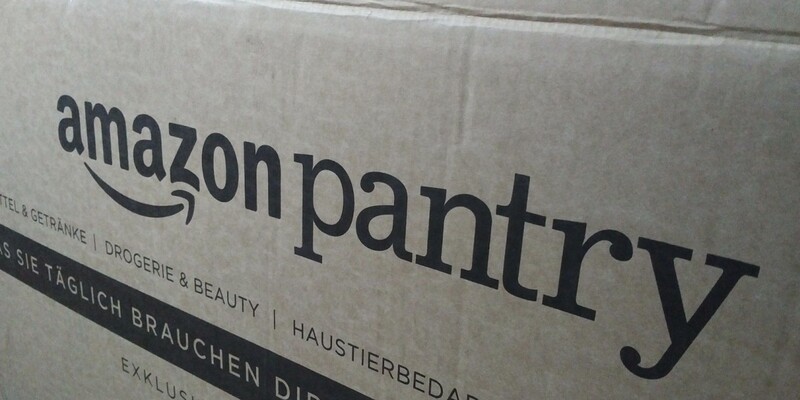 As someone who often uses Amazon for last-minute purchases, in some ways it’d be incredibly convenient if Pantry was a service ready for the prime time, if you’ll pardon the pun. However, it’s just not, and I’m struggling to think of a scenario in which it makes sense. The lack of fresh grocery deliveries means you’ll still be shopping elsewhere for your essentials and the overall breadth of grocery products isn’t all that great either. Sure, you could use it to add a few store cupboard essentials for delivery along with your next USB cable/pair of shoes/necklace/whatever you buy on Amazon, but you’ll be paying £2.99 for the privilege no matter how few items you order. In its current form, it’s not a challenger to supermarkets (or other online shopping methods) but with a little refinement and an expanded catalog of items, it might make sense in the future.